The six lakes that make up the Coosa River System, winding out of North-western Georgia, stretch all the way to the heart of mid-Alabama near Montgomery. All of these lakes have distinct characteristics of their own. During March and on into mid-April, the three upper reservoirs of the Coosa River System Weiss Lake, Neely Henry Lake and Logan Martin Lake will remain low (3-5 feet down) for winter drawdown. They are all usually back to full pool by the end of April. The three lower Coosa River reservoirs Lay Lake, Mitchell Lake and Jordon Lake are all kept at full pool year-round (except for 2 weeks scheduled drawdowns for dam inspections, usually lowered during the fall). They are very, weed-infested impoundment’s. There are no weeds in the three upper reservoirs Weiss Lake, Neely Henry Lake and Logan Martin Lakes six months out of the year, from November until April. 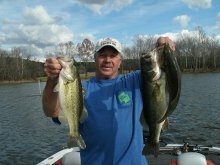 With new growing weeds in the three lower Coosa River reservoirs during early spring, and no weeds on upper Coosa River Lakes till late April, you have two totally different fishing situations to cope with during pre-spawn and spawning times on the Coosa River. 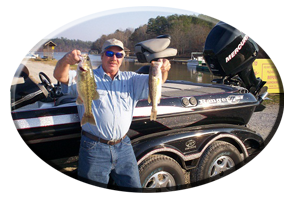 As May comes around, all six Coosa River reservoirs will be at full pool, showing newly-growing weeds and lots of post spawn bass, actively feeding in shallow water around wood, weeds and rock cover. 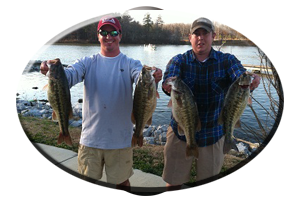 Logan Martin Lake on the Coosa River system, located near Pell City (and just 40 minutes from Birmingham), is fished heavily year-round. 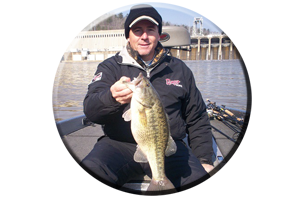 * Most tournament caught bass are returned to the lake, by bass tournament organizations, bass clubs and even general anglers now practicing, catch and release. This does little harm, especially when compared to the pollutants dumped in Logan Martin’s waters during the past few years. Major feeder creeks such as Choccolocco Creek and Broken Arrow Creek, have withstood the test of time…and man. Added to this, the building of homes all along the lake’s shorelines, from the lower lake dam to 25 miles up the lake at its halfway point along I-20 bridge. 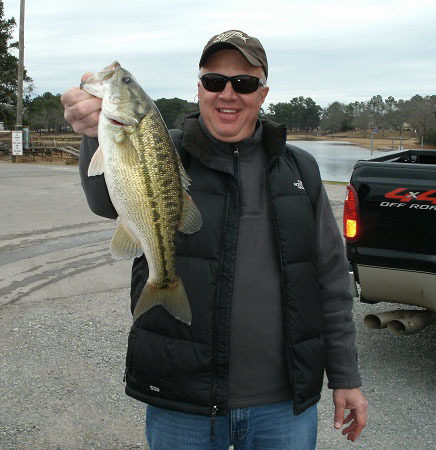 During the Summer, Logan Martin lake is The most recreational lake in Alabama. There are several mishaps each summer on its waters, due to reckless use of water crafts by careless boaters. Despite these negative aspects, there is still some of the best springtime bassin’ to be had in Alabama on Logan Martin lake, long after its Impoundment in 1964. Logan Martin Lake in March; While Logan Martin Lake is still low for winter pool in March, navigation is hazardous and extreme caution should be practiced, especially for first time boaters. The lake is usually down 4-5 feet until mid-April. * This caution flag, especially holds true when running past the lakes halfway point. From Interstate 20 bridge to the lakes headwaters (25 miles), just below upper Neely Henry Lake dam, use extreme caution, study a map, and watch your depth finder, when navigating these lake headwaters in March. This stump-infested, upper lake region, also has some of the warmest water to be found lake wide, during the pre-spawn period of March. Creek mouths, small pockets, cuts, islands and main-lake flats, in these upper lake regions, will heat up fast during March, especially with stained or muddy water conditions. Several warm days and mild nights, can bring up the water temperature tremendously. This is when the sun’s heat, quickly warms stained to muddy water, a lot faster. Stained water has particles, that help retain heat, when bathed in an all day sunshine. Much faster, than the clearer and much deeper water downriver. With any sudden rise in the water level (and a week long warming trend) a lot of prespawners will move into 1-5 feet of slack current backwaters, away from the main lake current, found in the upper lake regions. Downriver, on Logan Martin Lake, many bass will be coming out of a winter state of mind, in March. When these upper region bass are actually spawning, downriver bass can be eating voraciously, in prespawn conditions. Upriver water temperatures, normally hover in the upper 60′s by late March. Downriver, can still be 10 degrees cooler, than mid to upper lake flats in March. Concentrate your prespawn efforts along creek mouths, ledges and drop-offs. Also target first and secondary points, leading into shallow spawning grounds, in March. Like the bass, anglers should search out main lake flats and creek backwaters, finding the warmest water available. Topwaters, spinnerbaits, crankbaits, jerkbaits, lipless lures and swimming a jig combo, are all excellent “search lures” in March, for these actively cruising bass. When a cold front comes in, slow your retrieve on these lures. Create a stop-and-go action on these normally, fast-retrieved lures. Always try a variety of bottom bumping offerings and soft plastics when cold fronts slow the shallow water bite. 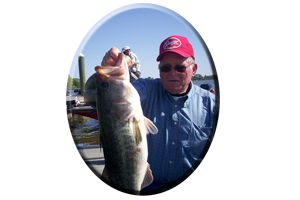 Cloudy days, (following several warm days and mild nights), are best this month, for shallow, BIG bass, especially on or near, a full moon. The bass of Logan Martin Lake go through some severe changes leading into the spawning month of April. As the cold, wind blown month of March fades away, so do the ever-changing prespawn conditions. This is accompanied with milder cold fronts, clearing water conditions and generally, water levels on the rise. These bass move up and down, with the prevailing conditions, cruising back and forth, in and out, of shallow spawning grounds. That is until stable water conditions, trigger, egg laden female bass to spawn. From mid-April until the mid-May, the lake will rise, from being down 4-5 feet low (for the last six months), back to full pool. Not only is this good for spawning bass, but for feeding bass as well, for not all of these bass will invade the shallows to spawn, as the lake level begins to rise. Many travel here, in the newly flooded shallows, to eat. This normally takes about two weeks. During this period, the majority of Logan Martin’s bass population, will be in less than five feet of water. Many, are big female bass. Some are the years biggest bass, caught in the month of April. 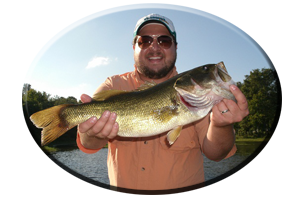 Most bass are fooled, by the astute angler, while either in the process of spawning or while recuperating from the spawn, in shallow water. Others are smaller male bass, protecting the bed and the newly hatched fry. The survival of these newborn bass, strongly depends on you. Catch and release, especially during Spring, assures future generations of bass (and other fish), for our future generations to enjoy. Catching bass in May, can mean choosing any lure in the box. Fishing in May, can mean a lot of previously neglected topwater lures, will now get used. From shallow, stump-filled backwaters to newly-growing weeds, by the first week of May, these bass can be fooled with a variety of topwater offerings. Buzzbaits, are good search lures and cover a lot of water fast. Always add a trailer hook for short strikes. Spinnerbaits are also in this category and model’s, with a variety of colors, weights and blade designs, are important for each fishing situation. In and around the thin, newly-growing weeds try soft jerkbaits, floating worms, lizards, frogs, rats and other weedless lures during May. This is also the time for fishing rip-rap rocks around dams, bridges, causeways, eroding banks and culverts. 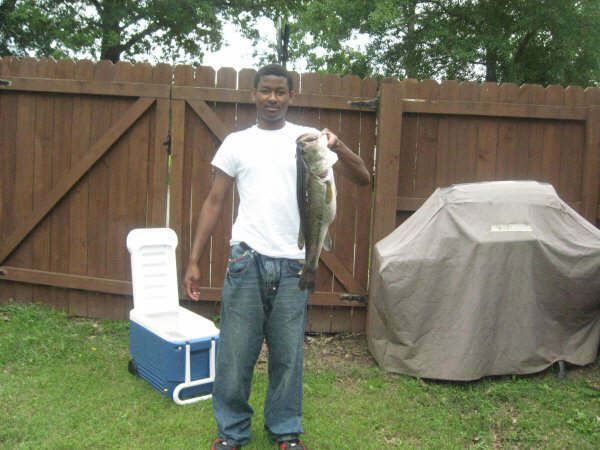 Try fishing these man made rocks with worms, lizards, crankbaits, jerkbaits, lipless lures and topwaters. Piers, especially near spawning grounds, will hold shade-seeking bass along with boathouses, floating docks and brush piles planted around these man-made structures. As the merry month of May comes to an end, bass will cease the rituals of spawning and go into their early summer patterns of feeding and following schools of baitfish. Now these bass will feed to regain strength, rebuild needed fat reserves, and many bass will find feeding a lot easier as they begin to school together, herding up the baitfish. Look for bass around the end of May, at the lakes headwaters, in the backs of feeder creeks and near deep water flats, as they seek out cooler, more oxygenated surroundings, as things begin to heat up for the upcoming Summer on Logan Martin Lake.